Jim gets to unleash his inner thirteen-year-old this week as he and Greg sit down with Alex Lifeson and Geddy Lee of the Canadian prog-rock legends Rush. All three members of Rush are known for their ridiculous virtuosity on their instruments – drum god Neil Peart, Lifeson on guitar, and Geddy Lee, who manages to play bass and synths and sing simultaneously. Lee and Lifeson met in junior high in Ontario and released a couple hard rock albums with drummer John Rutsey in the early '70s. But the band really hit its stride when Rutsey was replaced by Neil Peart, who also became the primary lyricist. They began crafting epic progressive rock concept albums like 2112 and Hemispheres featuring side-length sci-fi suites. The albums Permanent Waves and Moving Pictures brought Rush radio hits in the early '80s, and the band moved into a synth-driven phase. Over the ensuing decades, Rush has continued to evolve its sound and adapt to new styles, while growing a cult fanbase that is intense to say the least. 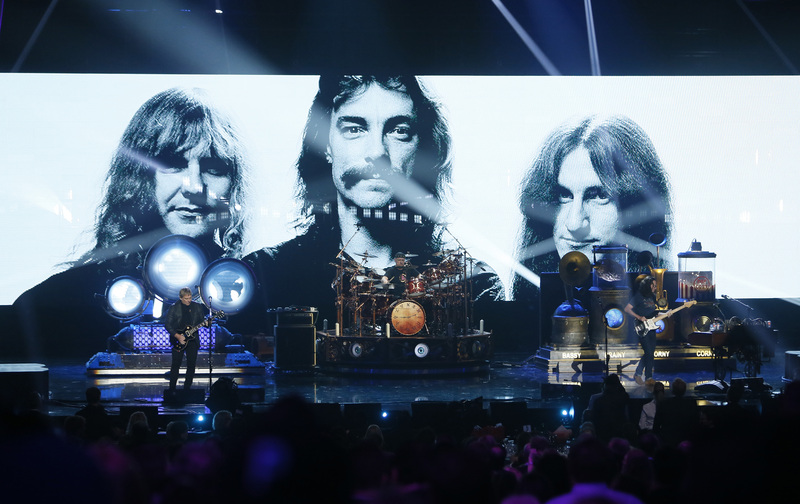 The band just celebrated its 40th anniversary with a tour and live album called R40 Live. Geddy Lee and Alex Lifeson discuss the band's evolving styles, the existence of female Rush fans, and whether the band will continue. Jim gets to unleash his inner thirteen-year-old this week as he and Greg sit down with Alex Lifeson and Geddy Lee of the Canadian prog-rock legends Rush. All three members of Rush are known for their ridiculous virtuosity on their instruments – drum god Neil Peart, Lifeson on guitar, and Geddy Lee, who manages to play bass and synths and sing simultaneously. Lee and Lifeson met in junior high in Ontario and released a couple hard rock albums with drummer John Rutsey in the early '70s. But the band really hit its stride when Rutsey was replaced by Neil Peart, who also became the primary lyricist. They began crafting epic progressive rock concept albums like 2112 and Hemispheres featuring side-length sci-fi suites. The albums Permanent Waves and Moving Pictures brought Rush radio hits in the early '80s, and the band moved into a synth-driven phase. Over the ensuing decades, Rush has continued to evolve its sound and adapt to new styles, while growing a cult fanbase that is intense to say the least. Geddy Lee and Alex Lifeson discuss the band's evolving styles, the existence of female Rush fans, and more.